This warm weather is turning my life around. I am welcoming spring in a major way - I could not be happier! I've started walking the pup every day, upping my vegetable game, planning out my herb garden, and in general I just have a little more pep in my step. It's amazing what a toll a long winter can have on your body and attitude. This week I thought i'd try my hand at a light burger and these Turkey Bruschetta Burgers were too good not to share. These burgers are hearty, melty, meaty and flavorful, just like a burger should be, but light on the calories. We skipped the buns, but i'm sure they would be delish on a bun as well. 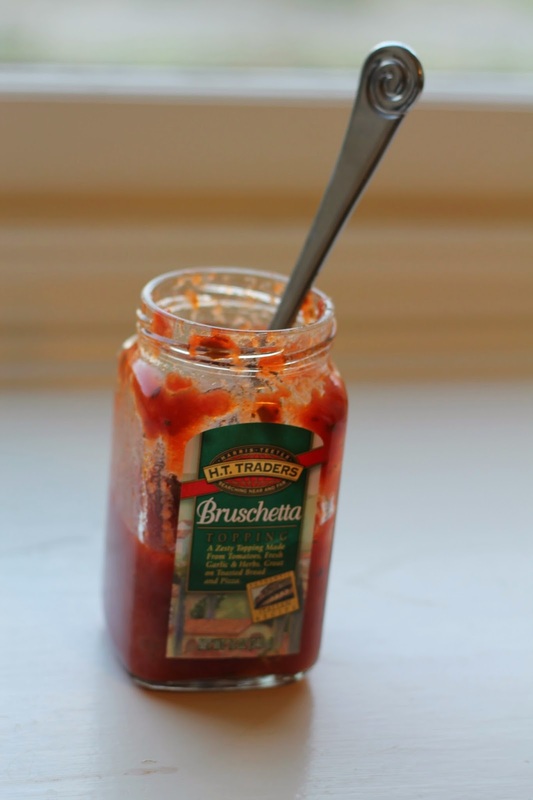 Harris Teeter brand Bruschetta Topping is one of my favorite prepared products. It has a delicious, rich tomato flavor and is great on bread alone, atop burgers, and sometimes I even blend it in my tomato sauces for extra flavor. I prepared my burgers in a pan but I'm sure they'd be great on the grill too. Enjoy! In a bowl, mix turkey, parsley, oregano, garlic and onion powder until just combined. Form into 4 equal patties. Preheat a pan over medium high heat and add butter and olive oil (the butter helps give the burgers a nice brown crust; skip this if you're grilling the burgers). Add the burgers to the pan and sauté until the turkey is cooked through, about 8 minutes per side. Reduce heat if the burgers start to burn. When the burgers are cooked through, reduce heat to medium low, top each with a slice of cheese and loosely cover until the cheese is melted, about a minute. Top each burger with a heaping tablespoon of Bruschetta topping. Enjoy!